Storage containers with lids are just what you need when you need to be able to safely and securely stack your storage boxes. 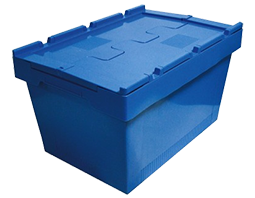 Our range of attached lid containers feature a hinged lid which, when closed, allow each storage container to be safely stacked or nestled one on top of the other. We provide a range of high quality, reliable and durable lid containers to customers all over Ireland and beyond with each container built to ensure the secure level of storage that you require. The 39L attached lid container is the smallest such container available but is suitable for storage of a wide variety of diverse items. The lid provides security and safety of the items within as well as enabling secure stacking. Ideal for storage in the home, business or industrial space. If you require a little extra storage capacity, the 58L attached lid container provides the ideal storage solution. Similar to the other lid containers available, each of these storage boxes can be identified for quick and easy identification and retrieval. The largest of the attached lid containers, the 75L container can perfectly maximise available storage space in any environment. Order these secure lidded storage containers online now to avail of great prices and a fast nationwide delivery service.